The genus Goodyera two species in Europe. Goodyera macrophylla is endemic to Madeira and Goodyera repens – Creeping Lady`s-tresses – is circumpolar in temperate and northern areas. Goodyera repens – Creeping Lady`s-tresses have their closest relatives in the tropics are not closely related to the other Norwegian orchids. It is found throughout the country, but are most common in northern Norway. In Western Norway almost completely absent. It can be found in birch forests but thrives best with moss rich ground in spruce and pine forests on calcareous soil and is considered an indicator plant for virgin forest. Creeping Lady`s-tresses has a close relationship with their fungal partners and are not self-sufficient in nutrient uptake even though the plant has green leaves. 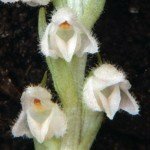 It has a system of creeping rhizomes and got its name because the stem bends nearly 90 degrees at the rhizomen. The leaves are 1-5 sitting in a rosette close to the ground. 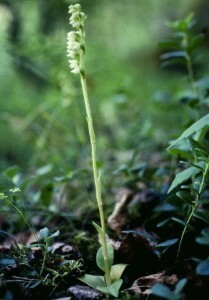 The leaves have leaf stalk which is rare in others orchids. The leaves also have a distinct network of nerves. Creeping Lady`s-tresses becomes up to 30 cm high. The hairy flowers are small and up to 30 are green white, have a sweet smell and sit twisted on a small stalk. Flower lip is shorter than the other flower bracts. Creeping Lady`s-tresses can have up to 30 flowers and it can fail to show up the ground for several years. Suddenly one summer is it there again to flourish. It occurs rarely in large numbers, often only a few plants that can be difficult to catch sight of.